Thanks for the detail and easy-to-follow instructions. We’ve overwintered greens for years without any covers, but last year they were wiped out by the unusually cold winter and I’m worried the same thing may happen this year. 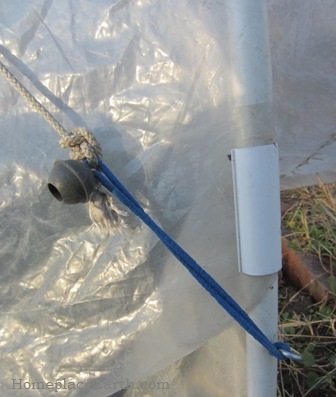 Your idea of using a cord to hold the plastic down is one I must try on my low tunnel with row cover next season. The row cover works great to keep the cabbage worms off the broccoli and cauliflower but the rocks and dirt on the edges is a real pain. Thanks. Wow! Thanks for the great explanation. I will try this technique next year. I am liking this a lot. You seem to have solved all the remaining problems i’ve been having with my hoop tunnels and I’m eager to try it. I tried 6 inch spring clamps this year and they work well. But I will have to look into this as I still use sandbags and snow this time of year. I had 40mph winds in the last snowstorm and the cover is holding well. I think my biggest issue now is lack of light as it’s been cloudy for 2 weeks here in northeast PA. Thanks for this post! I appreciate how you listed different options, because that encourages your readers to be flexible and use what they have. I got a little confused by the “wooden box” part, but I figured out that you were talking about wooden sides for a raised bed. One more photo showing the tunnel a bit closer than the entire thing, but not as close as your bungee shot would be helpful. We have a hoophouse and love it for kale, spinach, turnips, and salad greens. Maybe we’ll do a low tunnel next year, too. I’d love to grow purple sprouting broccoli and spring cabbage the way Charles Dowding does in England, and I think that might be a way to grow those hungry gap vegetables in Virginia. Kim, deciding what photos to include, and having them available is always a challenge. This post had five, which is two more than I usually do. I’m glad you have winter food coming from your hoophouse. It is great to have a harvest of fresh food through the winter! I had a 12×20 hoophouse for five years and loved it in the winter, but not so much in the summer. It would have been a good idea to remove the plastic in the summer, which I didn’t do. I like the flexibility of low tunnels–easily moved and easy to add, remove, or vent the covers. Here in central Virginia it is sufficient for my needs. Your pictures are great, thank you! I was just being greedy. Yes, we absolutely love having fresh food coming from the cold frames and hoop house. It is also good for my mental frame of mind to work in the hoop house. I love puttering in there on a cold sunny day; it feels like spring in there. Our hoop house is only 10’x12′ and is moveable. 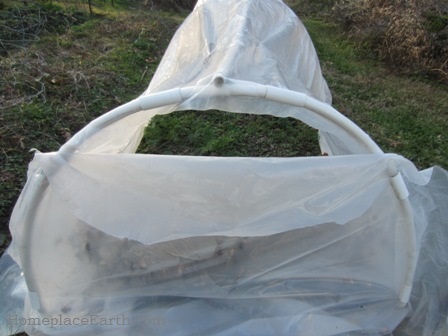 We carefully take off and store the greenhouse plastic in the spring, then replace it with the smooth kind of deer netting (to avoid killing snakes) that comes up to about 4′. 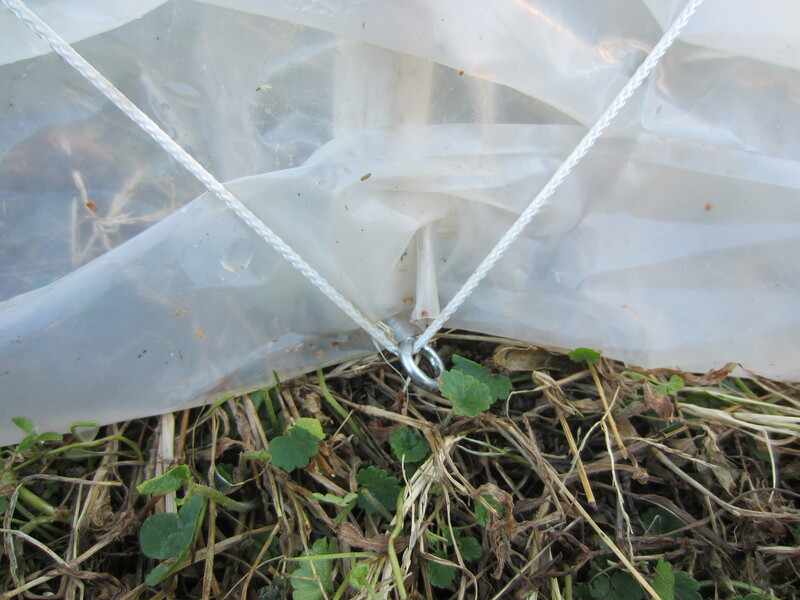 We plant sweet potatoes in the structure, and the netting keeps the deer out. They don’t jump in because they are afraid of the structure, and the netting keeps them from sticking their heads in and eating everything. Of course whatever vines that stick out get eaten right away. I really like your system to secure the plastic. One question: Does the edge of plastic actually stay down on the ground? From the picture with the eye hook, it seems that it would remain a couple of inches off the ground and create an unacceptable gap during cold weather. Hi Craig, yes the plastic stays down on the ground. You could make sure your screw eyes are at ground level, or maybe just below, so that there is not a gap. In the future I will probably switch to using hooks, rather than “eyes” to attach the cords so that I don’t have to thread them through.